... Morning! So glad you've dropped by. 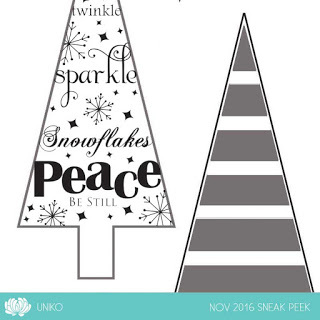 I'm here this morning with a quick sneak peek of some new stamps sets being released by Uniko on Sunday 27th November. The eagle-eyed among you might recognise one of those stamps from my recent Christmas card post - here! This is a fun set Christmas tree building set and you'll see more of them soon. SNEAK PEEKS: 23rd and 24th November - just a few teasers for you! INTRODUCING: 25th and 26th November - the DT will give you a closer look at the new sets being released with a daily blog hop. 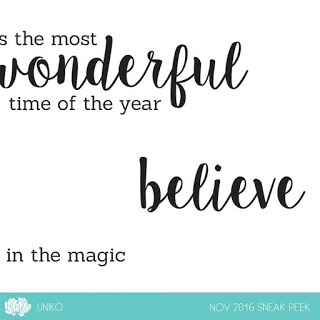 RELEASE DAY: Sunday 27th November 9.00am GMT - you get to see the products in their entirety and purchase them from the Uniko website. As usual there is a Design Team Blog Hop and a Giveaway. As this is the last release of 2016 - Bev is giving away some random prizes throughout the release countdown. To be in with a chance of winning a random prize, be sure to join in commenting along the Introducing Hops and joining in via social media such as Facebook, Instagram, Twitter and Pinterest. Winners of the random prizes will be announced on Bev's blog on Sunday 27th November at 8.00am GMT.